Want the best in tooth replacement? Dental implants are the only truly comprehensive option available today. For their effectiveness and high rates of success (as much as 95 percent in eligible candidates), implant dentistry is more popular than ever. Are you considering (or do you already have) an implant-retained tooth replacement? Learn more about the parts of the dental implant in Lynnfield from Dr. Rob Schumacher today. Traditional dental implants are made up of three components: the implant itself, its connecting abutment, and the prosthetic tooth that is attached on top. The procedure for dental implants takes from six months to a year to complete. Generally, a new part of the tooth replacement is placed at every stage of the process. You will likely experience the symptoms related to any oral surgery following the placement of your implant and the abutment. The actual dental implant is a tiny titanium cylinder that resembles a screw, or a miniature golf tee. This part is surgically placed beneath the gum line, where it will gradually fuse with the jawbone during the crucial period known as osseointegration. Once osseointegration has occurred — a process that takes four to six months to complete — the dental implant has healed with the bone tissue to provide a stable, secure root for the tooth replacement that is attached on top. 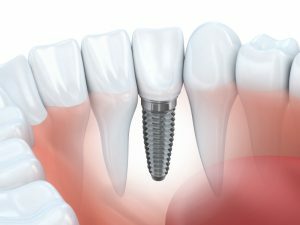 Because the dental implant is placed beneath the gum line, you will need a device to connect the implant to the crown, or the visible portion of the tooth. The abutment fills this role. It is a small connecting piece made of ceramic or titanium that ensures your crown fits securely on top. To place the abutment, your implant dentist opens the gum one more time, exposes the top of the dental implant, and attaches the new abutment. More healing is required between the gum tissue and the abutment before the final step of the dental implant procedure can begin. Finally, the dental implant is restored with the prosthetic that goes on top — or, as we like to call it, when the magic happens. The single tooth, bridge, or denture is attached to the dental implant with the help of the abutment, which will have healed before the prosthetic is placed. A single crown is fixed on top and can only be removed by the dentist. Bridges and dentures are generally removable for easy cleaning. Dental implants enjoy a success rate of as much as 95 percent in eligible candidates. But sometimes, a condition known as peri-implantitis causes initially successful dental implants to fail. Peri-implantitis is caused by excessive plaque buildup due to poor oral hygiene. You can prevent the condition and ensure the continued health and strength of your dental implant by performing excellent dental hygiene — like brushing, flossing, and visiting your dentist regularly. Would you like to learn more about dental implants? Find out whether or not you are a candidate for the most effective tooth replacement option available today. Contact your cosmetic dentist in Lynnfield to discuss implant dentistry today!